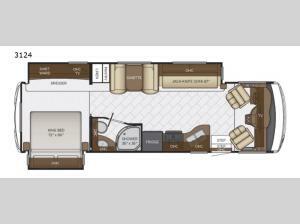 This Bay Star 3124 motor home by Newmar offers plenty of room with a full wall slide out as well as an additional slide out in the bedroom. Once you are parked then enjoy seating space at the driver and passenger seats which swivel around plus there is an 87" jack-knife sofa and a dinette. In the rear bedroom there is plenty of storage space with the two shirt wardrobes and dresser. You will also find a king bed, and with the sofa and dinette you can easily sleep six people in this model.